The authenticity and origin of all our gemstones, precious stones, gems for collectors, golden nuggets are guaranteed by our invoices. 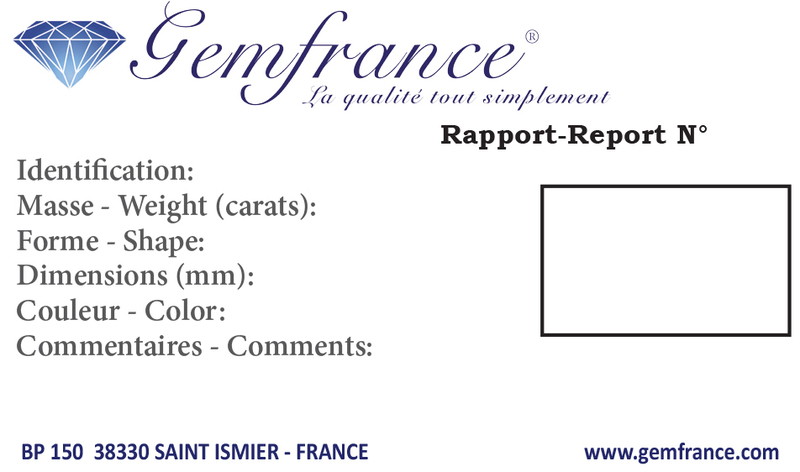 We also offer you the opportunity to have a gemological report from Gemfrance or a certificate from a gemological laboratory. We can product for each of our gemstones or our nuggets that we sell, a gemological report. He has the size of a credit card (see below). You will have the opportunity to order it before validating your order. Some of our gemstones already have a lgemological aboratory certificate. This is indicated on the information sheet of these gemstones. When we announce "unheated" for a single sapphire or single ruby, a certificate from a gemological laboratory has been previously established. And, if you want to get a gemmological laboratory certificate for other gemstones, we can tak care of it. We work with CARAT GEM LAB. This French laboratory has our preference for its great scientist reputation and its total independence with the gem trade. Som other laboratories are equally competent... but we have to choose.